Back on our first trip together to Japan in 2011, Naoto and I stayed with his mom for a few days. We watched her regular TV programs with her at night and enjoyed a game show about restaurants. A “food expert” (I can’t remember if it was a famous chef or a food critic or what) ate every menu item from a fast food restaurant and rated each item. Sometimes the food expert had high praise, but as you can imagine, the best TV was when the food expert criticized the best sellers on the menus. Apparently, furu pote (fries shaken in a bag with seasonings) are popular in several fast food chains in Japan and across Asia. 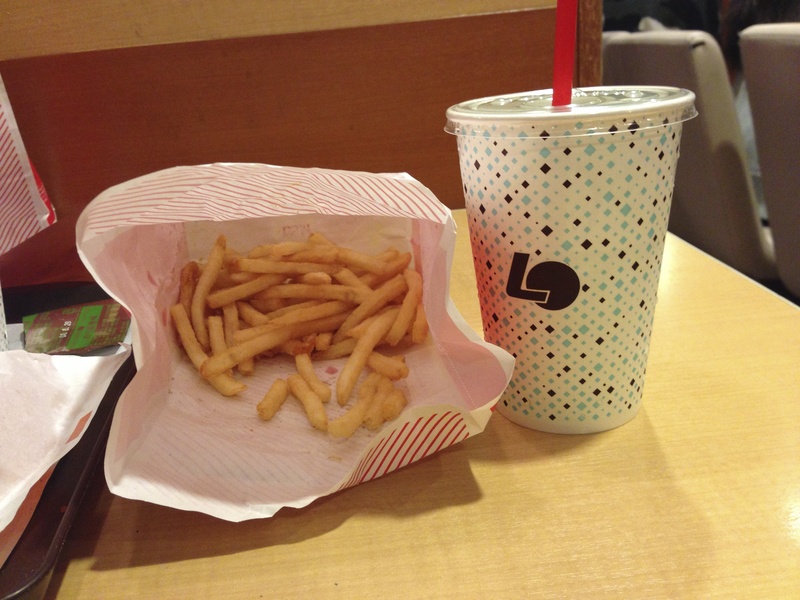 During our trip in March, we went to Lotteria and I got to try the fries for myself. I got the butter soy sauce flavor packet and Naoto got the seaweed. I enjoyed every bite of my fries and every sip of my melon soda. And still I wondered where this concept was in the US. For the past three years I’ve thought Americans would eat up furu pote like crazy. (Of course we would have to name it something else.) We could have sour cream & onion flavored fries, BBQ flavored fries, cheddar flavored fries. Where was this kind of thing in the home of the french fry? Well, last week I came across this article announcing McDonald’s plans to introduce flavor packets for their french fries. If you try it, let me know what you think. I haven’t eaten at McDonald’s since 1996 and a little flavor packet isn’t going to change that. But I’m excited to hear how they taste. So, even though the idea skipped across the ocean and is finally here in the US, when it comes to flavored french fries, Japan Does It Better! P.S. To see all of the other JDIB posts, go here. Have you tried the fries at Gabutto Burger at Mitsuwa? How do they compare? They have different powders at the counter. GASP!!! We’ve never eaten there (I am afraid of food courts)…but now I HAVE to go see!! Have you had them? I bet it’s the same thing–I wonder what flavors they have?!!! The fries without any powder are pretty bland. They definitely had wasabi and I think a cheese and a ranch maybe? I usually get the ramen there, I’ve only tried a little of my husband’s Gabutto Burger.